This is a book my students will definitely love. It is full of mystery, and adventure. Those two things go hand in hand. I believe a lot of my students will be able to identify with the characters in this book. Huber and Hannah Hill are twins and about as opposite as you can get. Huber is a math geek and shy. His sister Hannah is very outgoing and athletic. Like a lot of students I know there are expectations from the parents that just can’t be met. Huber feels this tension between himself and his father. Huber is also the victim of a bully, Scott McCormick. He stands up to Scott and ends up becoming friends with him. When Huber and Hannah’s Grandpa Nick passes away they miss him terribly. He was always telling them stories about hidden Spanish treasure. Upon his death they inherit a chest that has mementos, letters …AND…a treasure map! Hannah, Scott, and Huber set of to find the treasure and meet up with some very unexpected things. 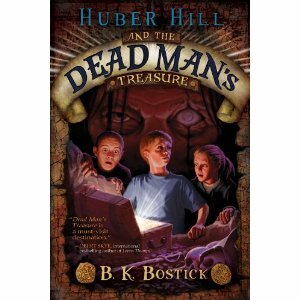 Check out this wonderful book to see if they find “Deadman’s Treasure”. To play a really cool game go here. Author B.K. Bostick will donate 100% of proceeds from sales of his new book, Huber Hill and the Dead Man's Treasure from October 1st -16th, 2011 to Alyssa and her family. The plot sounds really good, but the cover seems oddly familiar. I'll have to see if I can get a copy through Netgalley.